When I was a young person struggling to make sense of the concept of free will in a world that often left me feeling powerless, I asked my father to explain the seeming discrepancy between God’s foreknowledge and our own individual choices. The entire discussion was too long to duplicate here (and involved some of Daddy’s tendency to illustrate abstract ideas with simple drawings on the back of envelopes or dinner napkins 😀 ) but the gist of it was this: no matter how we choose, God can use our choice to work for good. Of course, that doesn’t mean we don’t make mistakes, and those mistakes can cost dearly, in pain and sorrow for us or the people who suffer the consequences of our actions. But no matter how many errors and bad decisions we make, we can never arrive at a place where there is not a best way out, no matter how dark it seems. As long as we live, it is never too late to exercise our free will to go in the right direction. Sadly, some people will make these choices, if at all, from jail cells or deathbeds. Yet the choice does remain, up until the end of life, and even decisions that seem so delayed as to be inconsequential still can affect the future. Nonetheless, it’s best for everyone if we make the right choices early, and often. Wherever you are today, you are the only person in your exact circumstances; the only one with precisely the same group of acquaintances, influences, and sphere of potential actions. You have more power than you imagine. How will you choose to use it? People have often criticized me for being a bleeding heart, a sap who gets taken advantage of by others out for their own gain. I’d rather error on the side of compassion than close my eyes and heart to the needs of the poor, the downtrodden and the needy. Bob, I agree. Better a bleeding heart than no heart at all! Once people have the experience of needing to be on the receiving end of compassion and understanding, it often changes their viewpoint. At least we can hope it does. Julia, good morning. Beautiful picture! I like the beauty and colorfulness. I like neatness, order and color in my life, everything in place. Hard for me to understand how others can tolerate messiness. I try to keep in mind…what looks messy to me may not be to others. Hi Merry, I loved the colors in Greece. Mykonos was a feast for the eyes. I love neatness but I am not very good at it when I get overwhelmed by too much to do. I am starting to understand how much a messy environment plays havoc with my moods and focus, however. I love having everything cleared away and properly stored. I think an orderly environment goes a long way toward fixing other problems. YES you do have power — each of us does — though we often do not realize it because we abdicate it to other forces who seek to control us for their own ends (not referring to Darth Vader here, more like commercials and other media-driven forms of brainwashing 😀 !) You have been a tremendous power for good in my life, and I am grateful for that! Merry, I think very few of us realize we have power, but we do. Just not the kinds we see on TV that are wielded by Superheroes and Evil Dictators and such. Once again you have been the voice of God for me. Even the photograph. For many years I have collected paintings, photos, replicas in every conceivable material of doors. This started in Brazil where artists commonly use doors as their medium. I have many doors from a large portion of the world. A favorite quote is from something advertised in a magazine that I can’t even remember given to me by a dear friend. ” I see a door I’ve yet to open”. I try to always choose to open the door. Going through it, well……that’s another matter. Sometimes it leads to disaster, but I hope I’m learning to see the blessing even in disaster. Thank you for affirming that God can make good from bad choices. May you and yours be blessed beyond compare. Seeing you use a pic again, for the first time. And I searched and searched – 1 March 2013. Bindu, he was surprisingly successful with those little drawings, considering how limited my understanding was (for example, showing how time is linear from our standpoint, but not truly a linear concept, and how things look quite different from different dimensions). I did enjoy the discussion. I smiled when I read your comment about being Libran because, though I’m a Sagittarius, my rising sign is Libra and I totally get it about seeing everything from different angles. Remember that the tendency to want to weigh and balance things can be a strength as well as a dilemma, though it can make decisions difficult! I don’t seriously believe in astrology but I think it’s fun to read about the various personality types, whether it’s via the Myers-Briggs Inventory or the Zodiac. The bottom line is, it takes all kinds to make up a world! Inspiring and Very True to every word. Thank you, lvsrao! I have to remember this sometimes when I feel discouraged about not being where I thought I would or should be by now. Hope you are doing well – thanks for being here! My husband and I are reading the book of Mark with our boys, who are 8 & 6. Last night we read from chapter 4 and talked about what it means to be a light/lamp to the world. The discussion is to long to post here 😉 But having a conversation with our boys who still have child like faith was awesome. Not sure about you but as I’ve grown older, I over think and over process. Children do not. Well mine don’t yet, ha. Anyhoo, we talked about being a light and how we can shine for those around us. “By making good choices” my boys said and then we brainstormed examples of some ‘good choices’. So that is how my household is going to use our power/light. By making good choices for those around us to see. As Matthew said, “You are the light of the world. A city on a hill can not be hidden… in the same way let your light shine before men so that they may see your good deeds and praise your Father in heaven”. Jenelle, kudos to you for having those discussions with your children. You are right, we do tend to over-think everything. It’s partly a personality thing, but also I think the tendency comes from having all these endless talk shows and discussions (even on blogs?) which is stimulating and fun, but will never replace simple action. Sometimes I think we confuse talking about something with doing something (especially in bureaucratic settings where the solution to any problem is to have endless meetings about it). My friend Peggy, about whom I wrote recently, is still not online at all (not even for email) but she lives a rich full life, never watches any TV but stays active and does so much to help others. It’s a joy to be around her and be connected to someone who prefers action to words (though she’s fun to talk to also! 😀 ) I like your connection between power and light. Thanks for your comments here! Today, I choose to help a lady from church who is in the process of adopting a 9 yr. old girl & her 2 yr. old brother. My wish is for her to see me as a willing servant & part of her team. Choices made to help others always feed my spirit. I believe God’s top priority is PEOPLE! My prayer is to encourage the daughter to learn & make good choices. Mary Ann, it is wonderful that you are willing to make yourself available to those who likely will need support, either now or in the future. Sometimes just knowing someone is there for you is enough. I agree with you that PEOPLE are what count most, and you will always be given the strength you need to help others. Thanks for caring! Thank you for the encouragement! 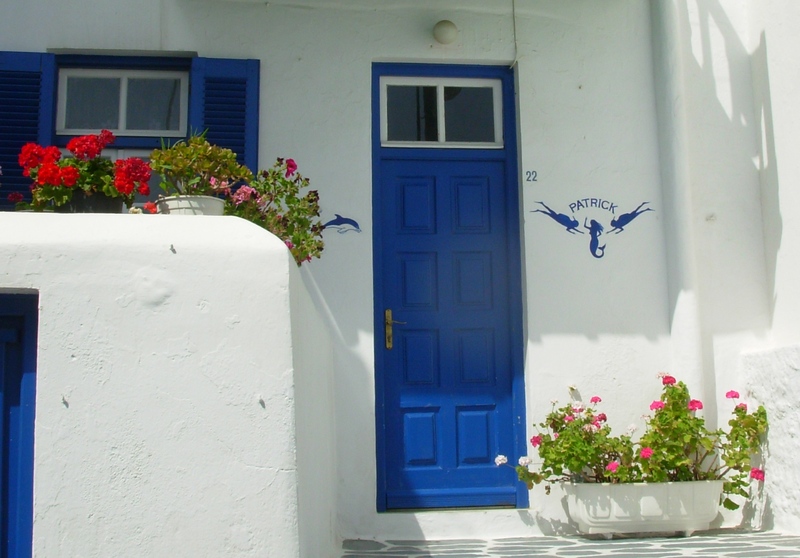 BTW: that does not look like the “blue door” I saw this morning??? FIne post, Julia. Change of direction is the best action when headed down the wrong road. The wise men after paying homage to the Christ child, recalled what Herod had asked of them. He wanted to know where the child was so he too could pay him homage. But, the wise men knew his true intent and returned to their homelands by a different route to avoid Herod. In Him is the change of direction that leads us home and happiness. Alan, I love that quote from Sheen and I had never heard it before. It’s so true! Thanks for sharing this inspiring thought with us. To test our knowledge and faith, one only has to think on how God has given us freewill to do as we decide. We are not restricted from doing anything but with that we are also provided the consequences for any decision we make that is contrary to His will. How long can we take or how many wrong decisions will we make before we learn God’s will? Each of us is different in those questions but we all are benefited by the promise of eternal life for obedience. May God bless us with a heart of a servant. This is a keeper. Thank you. I have shared it with a friend who has a printer and I will ask her to print it for me. Rereading it this morning, it dawned on me that it would make an excellent devotional at one of our Naomi meetings. PS Today’s is a keeper too. I thank God for you. Wow, Victoria, thanks so much for these kind words. Over the past day or two I have been feeling as if I am monumentally deluded to think that anybody wants to read such prolific and fairly hypergraphic output from me — it’s not like I’m Stephen King or Alexander McCall Smith, much less Joyce Carol Oates (all amazingly prolific and gifted writers). Though I keep this blog mainly to stay sane (writing is quite therapeutic for me) I am always grateful to hear that anything I have put out here has been helpful to someone else. For me, keeping a private journal tends to become too egocentric and whiny. Writing for this blog is a way of reminding myself, in the words of my precious Granny, to “be pretty” by keeping my eyes on higher ground. Thanks so much for taking the time to let me know it has helped you.